Welcome to Wow Us Wednesdays where we get together to share some inspiration. So many great links last week. Let's take a look at a few. Did you see Sonny's wonderful cozy setting for two in front of the fireplace? So cozy. There is a secret about the chairs. 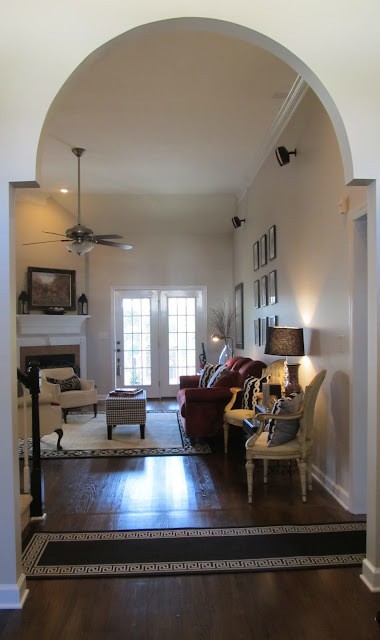 Tammy from Beatrice Banks shared her beautiful living room. 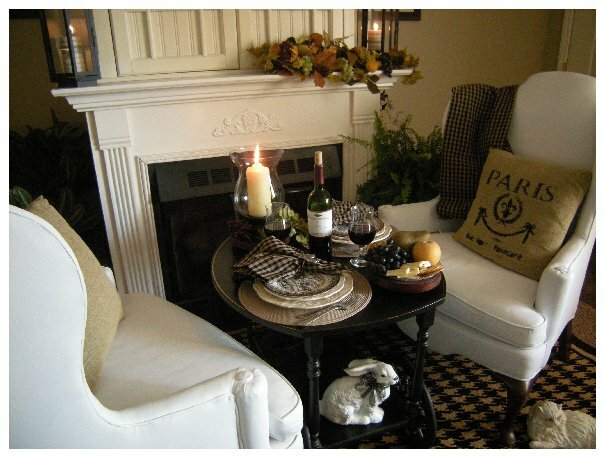 HouseTalkN shares her friend's beautiful fall decorated home. 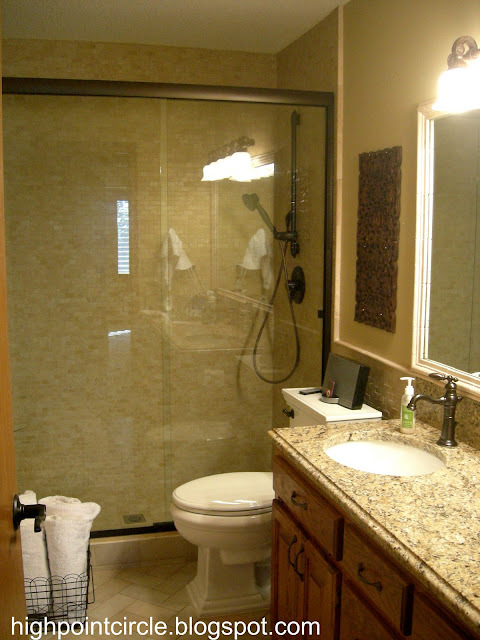 Beautiful bathroom transformation at Highpoint Circle. 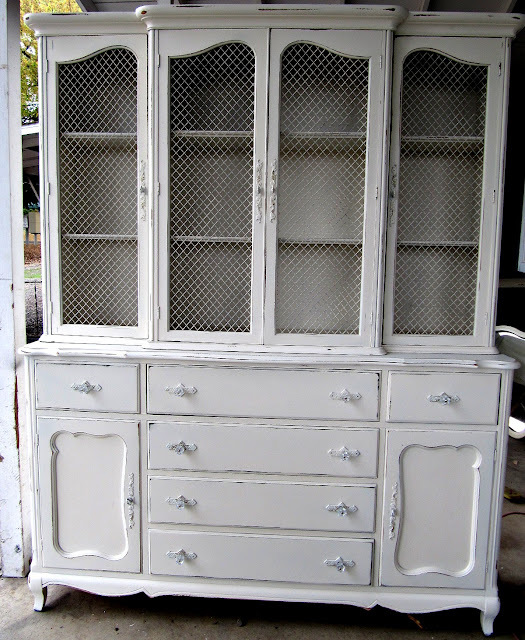 Pretty In Paint shares this gorgeous hutch and a free couch she was given. You must see it. Look at this pretty pie. Jennifer of Jenndiggs.com shares how simple it is to do. And forgive this proud Grammy for sharing one of Leila's professional pictures that was made last week. Thank you all so much for all the wonderful comments and congrats for our newest family member. We will be visiting with our other grands this week, but I of course will have the camera and laptop in tow. 2. Have a visible link or button in your post to this party or it will be deleted. Parties here or look here is not acceptable. Others don't need to hunt to find what parties you have joined. 3. Be a follower of this blog. Hi Kim, lots of great inspiration here. Many thanks for hosting. Your new grandbaby is just a doll! Dear Granny Kim, Congrats on the new little grand! Love seeing the features here on WOW. Sue told me you all had a wonderful time on Sunday. Isn't she just a hoot? thanks for hosting Kim. I love that picture of Leila! What a beautiful photo of Leila! Pretty, pretty eyes. Congrats too on the newest grandchild I saw that post too! Thank you for hosting as always! Hi Kim, Leila is beautiful. I need to visit a couple of those features that I missed. Thanks so much for hosting WOW every week. I'm happy to join in again. Congratulations, I know you must be so proud of the newest grandchild. Great features from last week, I love that pie with the Autumn leaves. Thanks for hosting Kim!! Little miss Leila is adorable!! Leila's eye's are so blue and that image is so pretty. Thanks for hosting. Congratulations on the newest member of your family. The 7th is my son's b-day too. And your Leila is darling! I am so looking forward to being a grandma. Soon, I hope :) Thanks for hosting this fun party, Kim. Oh my goodness, your granddaughter is adorable! Thanks so much for hosting Kim! Great features! Leila's photo is adorable! Leila is such a beauty with those big baby blues! Your little grandbaby has got to be the most adorable baby I have ever seen. It would have been worth it to the photographer to do these for free just so she could add them to her portfolio. Kim, thanks so much for sharing these great features!! There is a lot of inspiration here. Leila's photo is gorgeous! Thanks for hosting each week. How could you not be a proud grandma. Leila is precious. Great features. Love that pie. Thanks for hosting. Always amazed at the talent. Love cozy seating arrangements. I'm so happy about the new grandbaby! Don't think I'll be having more than the two myself. Such pretty eyes she has! You should be a proud grammy. Leila is just beautiful. Thanks for hosting. Leila has the most beautiful blue eyes...what a little cutie! Thanks for hosting, Kim! Leila looks adorable! Look at those gorgeous blue eyes...Leila is beautiful! Leila is just beyond adorable!! Thank you so much Kim for featuring my chairs. That was very kind of you. Beautiful features from last week. . . but surely the most beautiful is the portrait of your sweet granddaughter! Congratulations on your new grandson--is he the first grandson in your family? He's just adorable, as are his sisters and his cousin. You are very blessed! Thank you so much for featuring HouseTalkN! I love your link party and spend waaaay too much time peeking around at the other awesome link ups! That is such a beautiful portrait of your darling Leila! It just jumped right out at me! Even more than that gorgeous pie! haha! Thanks Kim! Oh my goodness, I squealed with delight when I saw myself featured on Wow Us Wednesdays!!!!! Thank you from the bottom of my heart--it makes me very happy and honored. May I do the same for you too. Thanks for hosting, Kim. Great features, and Leila's photo is so sweet. Thanks soo much for hosting, Kim. Leila is too cute! And congratulations on the new grand baby. He's soo sweet. =) Enjoy those grand babies!! Thanks for hosting...love Tammy's home...so very PRETTY!!! My Mother-in-Law, Leila just passed away last week. Your darling Leila is so pretty. Thanks for hosting. Wow, she is growing so fast!! Too precious! Leila has the most gorgeous eyes! Congrats on the newest family member! Still can't believe Sonny painted those chairs! Leila should have won the Gerber baby contest. I've never seen a prettier baby. Thanks for hosting WOW! Great features, as usual, Kim! Leila is such a little beauty! She looks like a baby model. Those eyes! We are all linked up and appreciate you hosting us! Fabulous inspirations~ Thanks so much for hosting Kim! Your picks are always an inspiration. 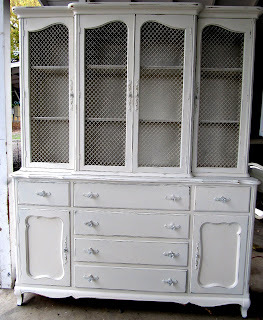 Finally finished my first dresser redo and I'm happy. Thanks for hosting. Share your granddaughter with us all you want. It's fun to see her grow and get even more beautiful as she does. Thank you so much for hosting - Hope you're having a great week. Omg!! The picture of your granddaughter is absolutely precious!! Those eyes! Her daddy is going to have his hands full beating the boys back some day! Congrats on your new little man! His picture was cute too! I want to hold a newborn and drink in their sweetness! What a doll baby your Leila is! Beautiful! Thanks for sharing those great features. 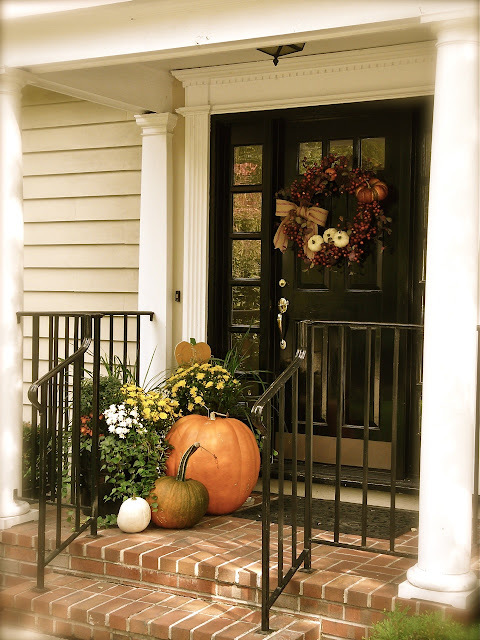 Absolutely love that gorgeous Fall front porch! Who could top Leila??? And I am inspired to break my diet for that pie! what a darling granddaughter you have! Thanks for hosting! Congrats on the new little grandson! Great features from last week! 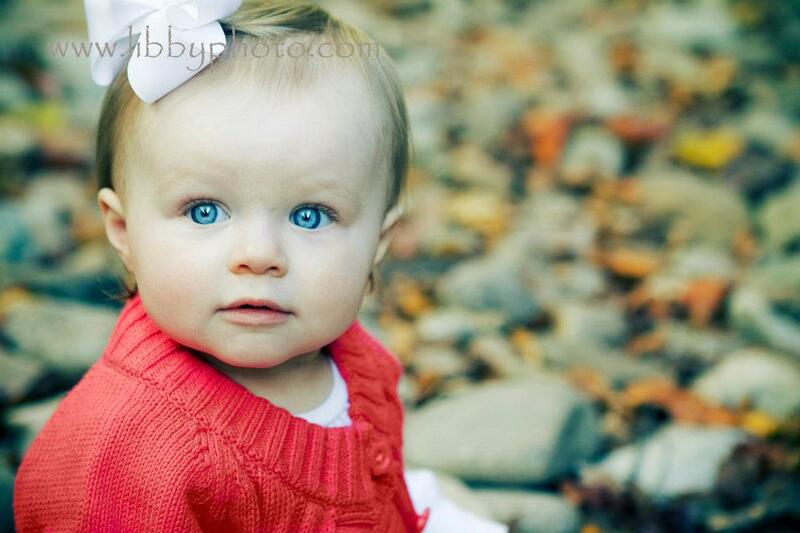 Your grand daughter has the prettiest eyes. Congratulations to the new baby. I have joined this party so I hope I have done all things right. I haven't seen this on swedish blogs but it seems very fun and I can find new blogs to follow. Loved all the features and now off to visit some of the bloggers. Have fun with your adorable family..that photo of your baby girl is awesome. She's so beautiful. Thank you so much for including my post in your features! I'm so honored! Leila is a doll baby! Again, thanks for hosting the party. Oh I love that cozy seating for two and your granddaughter's photo is stunning! Those blue eyes!! Gorgeous! Kim, your granddaughter is gorgeous!! I shared an apple strudel recipe, a Pennsylvania Dutch turkey stuffing recipe, and a Lithuanian blynai recipe today. Thank you for hosting us again and have a great week! Well just wanted to say hello - your granddaughter is beautiful by the way and congrats on the new grandson. It was nice meeting you this past weekend at Sue's. Your sister found me thank goodness. You've had an exciting week, new grandson (so adorable), time with Leila and lots of redos, and you still make time to host this fabulous party. Thank you! I love browsing the links. So many amazing ideas. Thanks Kim for hosting this great party, I get some much inspiration from everyone. This is my first time linking up as I am new to blogging, hopefully I did it right! Always so many great ideas to be found here. Thanks!!! wow!!! !what a great party this week!!! I **may** have posted my contribution twice; I did something weird when linking. Apologies and feel free to delete any extra post or odd stuff that may show up on your computer. You'd think I was a newbie ... oh, yeah, forgot, I am. Duh! Leila is so cute~and now lucky you! You have a little grandson!! Thanks for hosting the party! What beautiful features once again! And it looks like you will have a lot to be thankful for this Thanksgiving! My first visit to Savvy Southern Style and all I can manage to say is, "Wow"! I'm a new follower...found you at Cedar Hill Ranch. I'm a brand new blogger and happy to join the party. Your grandbaby is such a cutie! What a sweet name! Lucky you! There are so many talented people here, it will take me all week to look through them! Well now you know I forgot all the other pictures when I saw that beautiful baby! She is so darling! I love Wow Us Wednesday. So many blogs ... so little time! It's hard to read them all but I'm inspired by everyone's creativity. Thanks for hosting! Wonderful party, Kim. Thank you so much for hosting!